Even to those oblivious to religion Aarti conjures images of Puja. The dazzling sights, the deafening sounds that make the blood boil in feverish anticipation, the fragrance of the floral offerings and the aroma of good food; needless to say the vibrant ritual of Aarti is at the heart of Durga Puja. Music too is integral to the glorification of Ma Durga, which unlike events of other Eastern religions is an elaborate social event. Praises to the Goddess and her wards are expressed through a long tradition of Aarti -- chanting of the mantras, rendition of the songs, and the performance of dance numbers. To the devotees, these give vent to feelings and emotions. It's a proclamation of all that is good, joyous and fun, and the festival is the perfect time to let themselves free and dance away through unhindered happiness and enjoyment. Dance forms an integral part of worship in Hindu rituals. Each hand gesture (mudra), movement, or facial expression done before the Goddess bears a significance instantly recognised by the audience. This sort of dance is not just a form of worship in its own right but also a source of entertainment that recount stories about the Gods. Worshippers, however, may also dance spontaneously. Sharadiyo celebration is deemed incomplete without an evening of 'dhoop' dance. Performed by men, this form requires them to hold a clay pot filled with burning incense sticks and coconut husk and dance to the beats of the 'dhaak'. There are also dance competitions held in many places of worship and the performances are a visual as well as spiritual treat. As far as Aarti comprising dance numbers are concerned, not all the Puja Mandaps make arrangements for them. 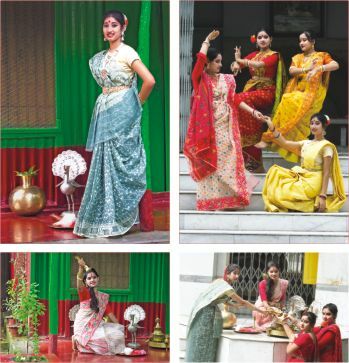 The competitions, too, are not a general event in all the Puja stages in Dhaka or around the country. At Kumudini, Mirzapore, dance numbers performed by the students of Bharateshwari Homes are at the heart of the Puja celebrations. There, Ma Durga is set on a stage, standing on her lion mount, wielding ten weapons in her ten hands. This is the religious centre of the festivities, and the crowds gather to offer flower worship or pushpanjali on the mornings of the sixth to ninth days of the waxing moon fortnight known as Devi Paksha (meaning the period of the goddess). Songs are rendered on the days of Shaptami and dances are performed on the days that follow till the Dashami. The 'Bhaashaan' or immersion of the Goddess in the Ganga takes place on Dashami, and is preceded by huge processions on roads carrying the idols for immersion. Also called Niranjan, immersion of the deity gives devotees something to hope for. They earnestly pray that the Goddess, along with her wards, will return the coming year and all shall dance, welcoming the deity to her father's abode -- the Earth we call home.